To see the formation of materials in synthetic, biological and geochemical systems, scientists use electron microscopy techniques. 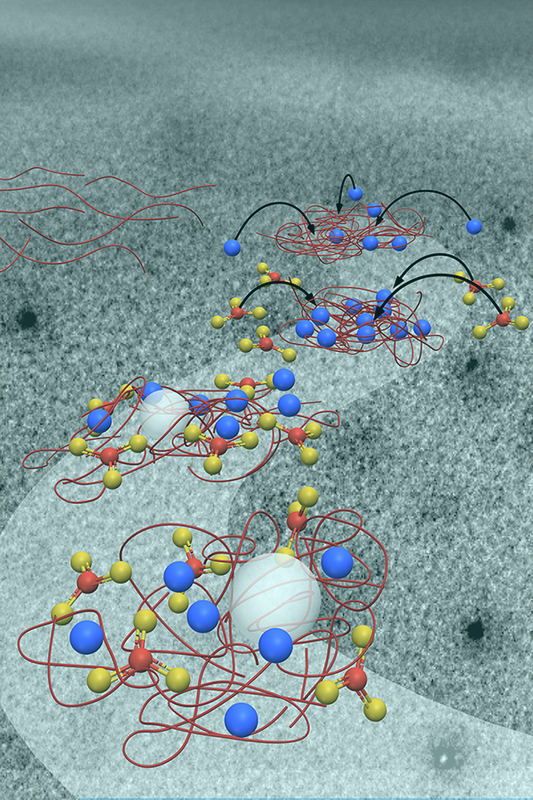 Here, researchers found calcium binding (blue) to the polymer (red strands) leads to the formation of a macromolecular scaffold that controls the location and phase of calcium carbonate nuclei (white particles). Enlarge image. Whether it's an electronics manufacturer or Mother Nature, materials are often created in liquids. Improving these materials means getting a clear look at the ultrafast, complex processes that form them. Few instruments are up to the job. Two techniques are: liquid-phase transmission electron microscopy (TEM) and cryogenic TEM. Experts in these techniques and others, Dr. James De Yoreo at Pacific Northwest National Laboratory (PNNL) and Dr. Nico Sommerdijk at the Eindhoven University of Technology discuss the use of these instruments in an invited article in Nature Reviews Materials. They begin the review by showing how scientists have used both approaches to describe intricate processes and structures. They discuss research into nucleation paths, nanoparticle interactions, and how lipids and other soft matter assembles into larger structures. They also highlight bio-inspired or bio-mimicking systems. They conclude with a look at how the future abilities of these two electron microscopy techniques will provide even an greater understanding how materials form. James De Yoreo: De Yoreo leads PNNL's effort known as Materials Synthesis and Simulation across Scales. During his career, he has pioneered the use of molecular-scale imaging techniques to visualize materials formation in real time. He was among the first to visualize proteins assembling and attaching in mineral systems and measure the forces involved. De Yoreo is often funded by the U.S. Department of Energy's Office of Science. Nico Sommerdijk: At the university, Sommerdijk is a full professor. He works in bio-inspired and multiscale materials in the Laboratory of Materials and Interface Chemistry. He focuses on creating practical, bio-inspired hybrid materials and examining those materials, often using electron microscopy. Sommerdijk's funding sources include the Netherlands Science Foundation. Sponsors: This work was funded by the U.S. Department of Energy, Office of Science, Office of Basic Energy Science, Division of Materials Science and Engineering (JDY) and a Vici grant of the Dutch Science Foundation, Netherlands Organisation for Scientific Research, The Netherlands (NAJMS). Short summary: To clearly see the formation of materials in synthetic, biological and geochemical systems, scientists use power electron microscopes; James De Yoreo at Pacific Northwest National Laboratory and Nico Sommerdijk at the Eindhoven University of Technology review the insights gained with these microscopes and discuss future directions in an invited article in Nature Reviews Materials.